There is nothing but blank carpet under the Christmas tree. Crumbs rattle in empty cookie tins. Carefully placed holiday adornments are starting to feel more like clutter than decoration. Time to put it all away. And while I’m at it, I think I’ll do some personal year-end filing. The joys, happy moments, travel, family, friends and fun of 2011 along with the the simple fact of another year of life are filed under Gratitude. I’ll keep that one near the front and refer to it often. Regrets belong in the back and should be left alone. Nothing useful will be gained by revisiting them. 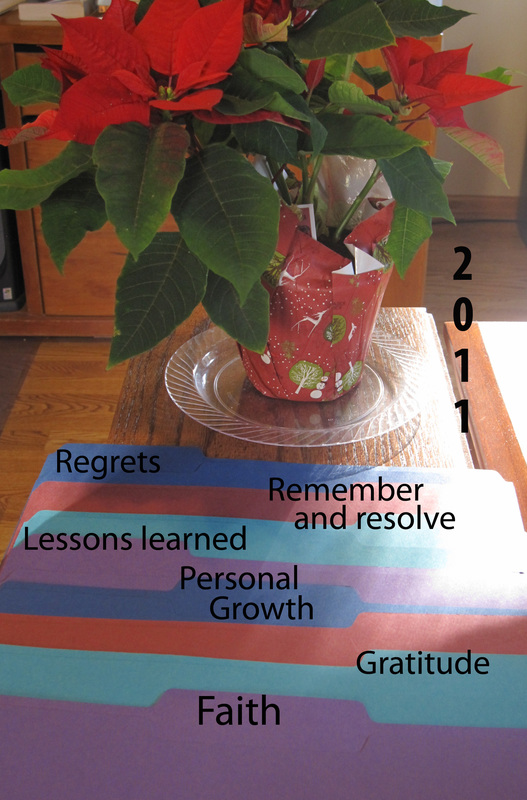 Goals achieved, challenges met, accomplishments and new opportunities fill the ever-expanding Personal Growth file. I place this file right behind Gratitude. On the other side of Personal Growth, and closely related, is the file I’ll euphemistically call Lessons Learned holding a sorry collection of sins and mistakes. At least the ones I know about. The sins have been confessed and forgiven, and foolish missteps have been recognized in order to (hopefully) transform them from failures to ultimately freeing life lessons. Pain, hurts, and disappointment deserve some careful attention, for if I stuff them in a file drawer without a close look they will escape to become fodder for new sins and mistakes, future Lessons Learned. For now, I think I’ll call that file Remember and Resolve. I want to settle them now. The file at the front of the box also serves as a heading for all of the above: Faith. 2011 was another year of God’s provision, protection, and guidance, another year of new knowledge of and experience with the glorious God who is both powerfully sovereign and lovingly personal, another year of sins forgiven and mistakes redeemed, another year of increasing freedom and joy. Another big item for the Gratitude file. What does your year in a file drawer contain? Gallery | This entry was posted in Christmas, Faith, Reflections and tagged Faith, Year End. Bookmark the permalink.